OK, I got tp to admit this one is a bit weird. I mean the thought of wearing a tooth around one's neck. Made from Maple, roughed it out on the band saw and began the process of shaping the tooth. Lots of carving, lots of sharping the knife as sat and chipped away. Man... maple is hard! The odd part, when I started sanding, was I was having a hard time deciding what to sand smooth and what to leave a little rough. 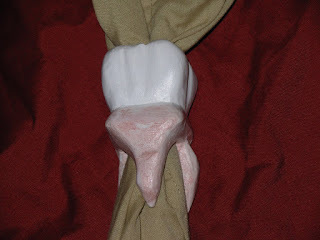 In the end I smoothed the part above the gum and left the roots somewhat rough (like a real tooth). Two coats of white craft paints and waited for it to completely dry before giving the roots a dark brown wash. A couple of coats of poly finish it off.